The second Gannet was laid down 1 May 1959 by the Tacoma Boatbuilding Co. Inc. Tacoma Wash.; launched 2 May 1960 [correction 26 May]; sponsored by Mrs. Frank P. Luongo Jr.; and commissioned in the Puget Sound Naval Shipyard 14 July 1961 Lt. E. L. Gaylor in command. After shakedown Gannet departed Puget Sound 4 August and arrived Long Beach Calif. 9 August. 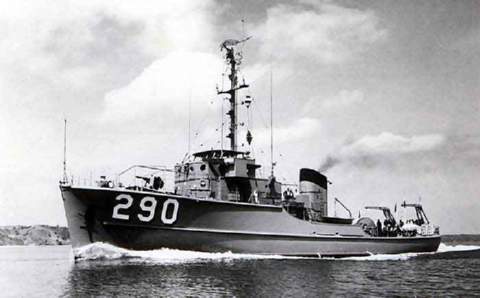 As a unit of Mine Division92 she operated off southern California and conducted exercises in mine countermeasures. During the first 2 weeks in June 1962 she participated in Joint Task Force 8 nuclear tests off the California coast. Local operations out of Long Beach continued until 2 July when she departed for Japan via Pearl Harbor Midway and Guam arriving Sasebo 13 August. After type training off the Japanese coast with Mine Division32 she departed Sasebo 1 October for Chinhae Korea where she joined in mine force exercises with units of the Republic of Korea Navy. After returning to Sasebo 7 October she steamed to Okinawa Hong Kong and Taiwan before returning to Japan early in November for additional type training that included schoolship service out of Yokosuka. During the next 2 years Gannet continued operations out of Sasebo Mine warfare exercises and training in mine countermeasures sent her to Korea Okinawa Taiwan Hong Kong and the Philippines. During July and August 1964 she performed special mine countermeasure operations in the South China Sea while supporting U.S naval operations along the coast of Vietnam. She returned to the South China Sea in February1965; participated in a joint amphibious exercise with ships of the Thailand Navy; then steamed to the Vietnamese coast in mid-April to resume special duty. Gannet returned to Sasebo 24 May and for more than 6 months operated along the coast of Japan. Early in December she returned to the coast of Vietnam where she joined Operation "Market Time" as a coastal surveillance patrol ship. During her patrols she inspected hundreds of Vietnamese fishing boats in an effort to control the infiltration of Viet Cong troops and supplies. In addition she provided treatment for South Vietnamese fishermen requiring medical aid. She departed Vietnam 14 January 1966 and returned to Sasebo the 29th. She served along the Japanese coast until 10 April when she again sailed for South Vietnam arriving 10 days later to resume "Market Time" patrols. During the remainder of the year Gannet made three patrol and surveillance deployments along the Vietnamese coast. In addition she participated in SEATO minesweeping exercises in the Gulf of Thailand. At present she remains assigned to the Pacific Fleet and operating out of Sasebo continues to support the forces of freedom against Communist aggression in Southeast Asia.